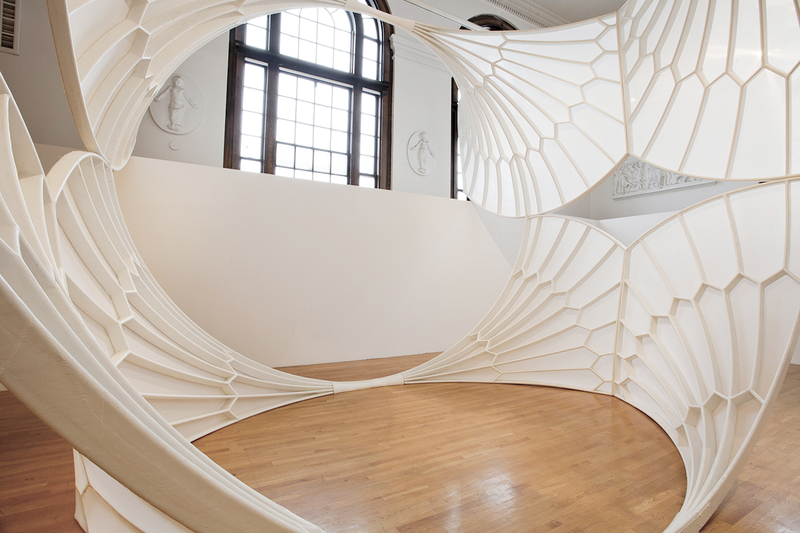 The artists and designers in Edifice Amiss: Constructing New Perspectives build sculptures and site-specific installations that challenge us to see our constructed world anew. Reinventing the ways in which we experience space, Lead Pencil Studio and David Henderson recontextualize architecture by manipulating scale, appropriating familiar motifs, or redefining myriad spatial relationships. Our relationship to buildings is often taken for granted, but the works in this exhibition – whether an abstracted abbey ceiling tilted on its side or an elevated evocation of a city street – reveal overlooked and sometimes hidden features of the architectural spaces in which we live and work. This exhibition was curated by Lisa Tung, Director of Curatorial Programs.